Rolanda Issa’s Eternal Kings does something which strikes me as such a ‘why has nobody done this already?’ thing it kind boggles my mind. Eternal Kings to explain it in a simple way takes Chess, which almost everybody has played at some point, and combines it with a card game like for example Magic The Gathering. But that simple explanation does a disservice to the depth of the game. The pieces of the chess board, pawns, rooks, knights, bishops, queen and king are replaced by creature cards on the board that make up a player’s army. These creatures have attack, life, discipline and abilities. Different abilities impact how the game play unfolds, but the use of abilities is strategic as once a creature has used its ability it won’t be able to use it again the next turn. The aim of the game is to kill your opponent’s king. Player’s also have a deck of ability cards which will come into play during the game and further impact gameplay. Cards are split into four factions Strength, Agility, Wisdom and Intelligence and each of those factions has different strengths and weaknesses. Strength favours initiative and brute force, Agility favours speed and traps, Wisdom favours defence and coordination whilst Intelligence favours versatility. This is all set in a fantasy version of Earth struck by cataclysmic events where the elements themselves have come alive to strike down humanity. A fight for survival begins. Some embrace the elements, some embrace the chaos, some turn to ruthless warlords that promise them salvation, others embrace prophets worshipping forgotten dark gods. This world is brought to life via some impressive art work. 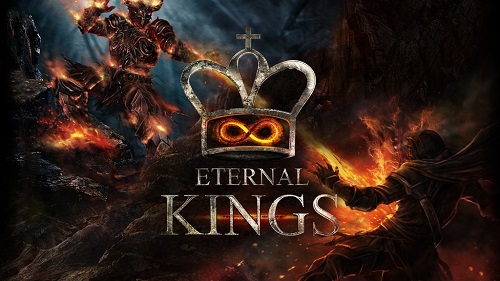 There are lots of board games and card games fighting for backers on Kickstarter from established gaming companies, Eternal Kings isn’t one of those. This is a game that has a lot of potential, both as a game with plenty of depth and replayability, and as a game that can easily be expanded in the future. Eternal Kings is currently on Kickstarter.